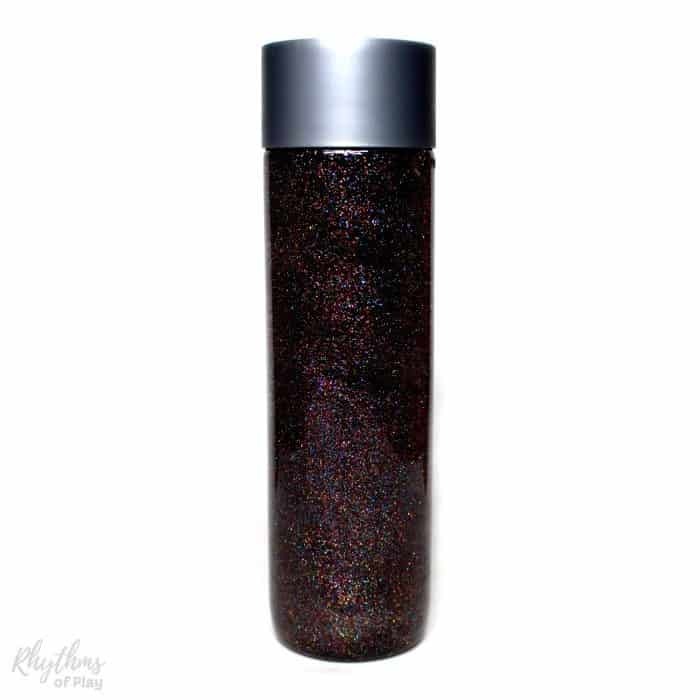 Both children and adults will love this rainbow glitter galaxy sensory bottle. The perfect way to calm an anxious child – When it swirls it looks like a rainbow galaxy, and when it stops it looks like rainbow-colored twinkling stars slowly falling in the night sky. Make galaxy glitter sensory bottles for a galaxy themed study unit or a space themed birthday party! Calm down bottles like this are most often used for no mess sensory play, to help calm an overwhelmed child, as a “time out” timer, or as a meditation technique for children. They are just as effective for adults. For more information check out Calm Down Sensory Bottles 101. This is one of my all-time favorite sensory bottles! The photos above and below do not do this amazing bottle justice. You have to make one so you can see how it amazing it is when it swirls, sparkles, and shines! We love to watch the twinkling rainbow of colors! 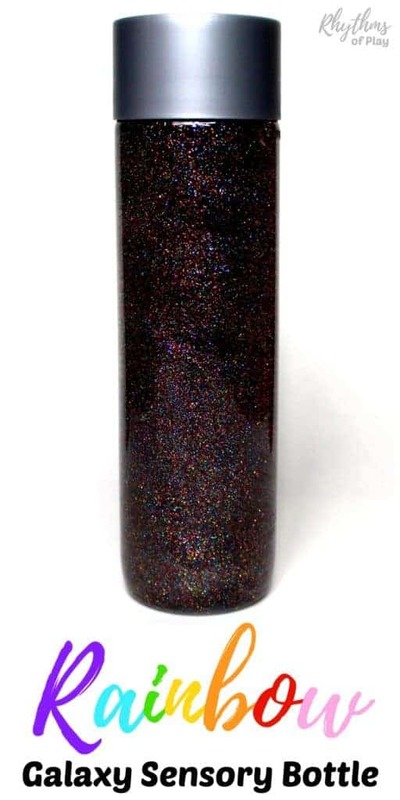 This sensory bottle is made with a rainbow of glitter glue colors to produce a swirling galaxy of twinkling stars! 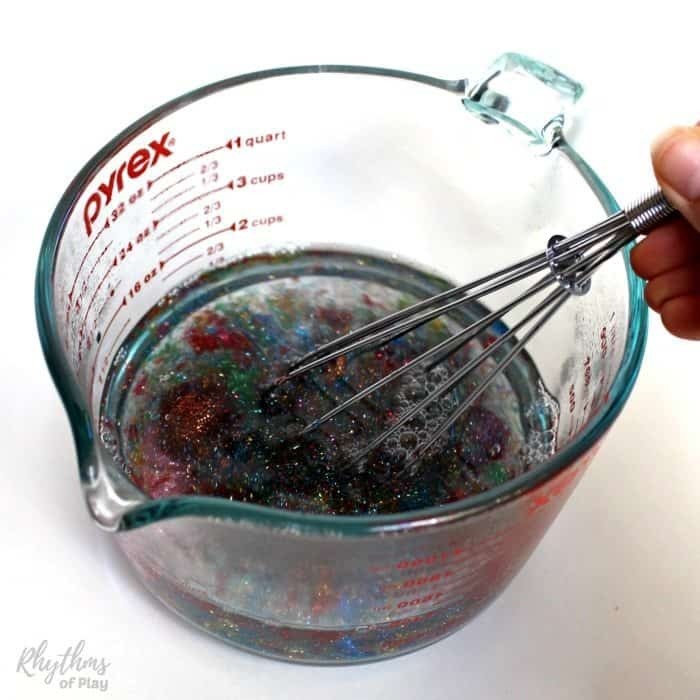 Follow the simple step by step directions below to make your own rainbow galaxy sensory bottle. Remove Lable and use Goo Gone to remove any sticky residue. Pour 1 1/2 cups of hot water into a 1-quart measuring cup. 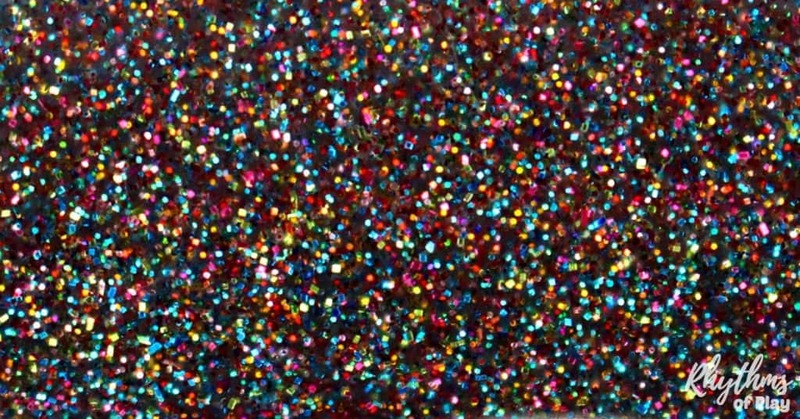 Squeeze 1-2 tbsp of each color of Sargent glitter glue into the water. We didn’t measure. Instead, we emptied each bottle until it was level with the top of the glitter glue label. Give it a final stir and pour the mixture into your bottle. Place lid on the bottle and give it a shake to see if you like it. Need more glitter? Add it in before topping it off with water. Play with it for a day or two to make sure you are happy with it before gluing it shut. Both children and adults will love this rainbow galaxy sensory bottle. Don’t forget to pop over to have a look at Calm Down Sensory Bottles 101 for all our sensory bottle making and troubleshooting tips. Does it matter what brand of glitter glue I use? do you have to use glitter glue or can you just use glitter and water? I love this combination! Looks great! What glitter color combination did you use? I used the recipe and method described in this post. If you need further clarification on any of the ingredients or steps described please let me know.